Getty ImagesAn Andy Warhol piece — but not the one in question — at an auction. Andy Warhol’s painting ’14 Small Electric Chairs’ is to be sold in a partial exchange for cryptocurrencies on June 20. London-based art gallery Dadiani Fine Art, which has dealt in cryptocurrencies in the past, will oversee the deal. A piece of Andy Warhol’s artwork is among the latest items to be sold for cryptocurrencies. The painting is Warhol’s 1980 piece “14 Small Electric Chairs,” and it’s reportedly valued at around $US5.6 million. Dadiani Fine Art, a London-based gallery headed up by art dealer and “crypto-economist” Eleesa Dadiani, plans to accept 49% of the painting’s cost in exchange for bitcoin and ethereum. Dadiani, who is known by her nickname “the Queen of Crypto,” has previously overseen deals for luxury items like rare cars and fine art in exchange for cryptocurrencies. Dadiani’s gallery, which began accepting cryptocurrencies last year, is among the first in the UK to accept digital currencies in exchange for art. 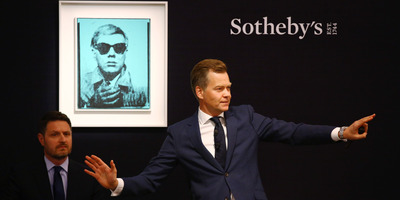 The auction for the Andy Warhol painting will take place in a public online auction on June 20.